In his blockbuster book The Law of the Garbage Truck David J. Pollay showed how to deflect the negativity that derails our goals and leaves us stressed and miserable. 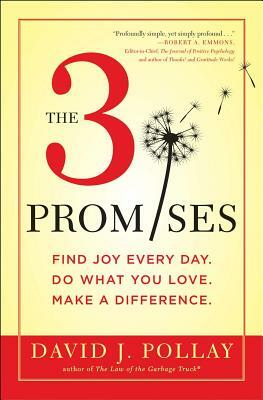 Now, in this inspiring follow-up, Pollay explains how making three simple promises to yourself--"to find joy every day, do what you love, and make a difference"--can radically enhance every aspect of your life. Illustrating his points through memorable, personal stories, Pollay makes it simple to practice transformative strategies that help us achieve fulfillment. David J. Pollay, M.A.P.P., is the creator and author of the international phenomenon, The Law of the Garbage Truck(R), now translated into 12 languages. Pollay is an internationally sought-after speaker whose work has been featured on ABC, NPR, the CW, Univision, and in Businessweek Small Biz Magazine, Business Digest, the Chicago Tribune, the Los Angeles Times, and media worldwide. He was a featured speaker at TEDx Delray Beach. Pollay is a founding associate executive director of the International Positive Psychology Association and has held leadership positions at Yahoo!, MasterCard, Global Payments, and AIESEC. He lives in FL with his wife and two daughters. Visit David online at davidpollay.com. For information and resources about The 3 Promises, visit the3promises.com.